How will the City of Calgary address its budgetary issues in coming years? Will the City rely on property tax increases? Will it hope for and ask for higher levels of funding from the provincial government? Will it launch into an agenda of cuts to programs and services? Will it be lured toward privatization? Or will it explore new revenue options? Fortunately, it is clear what Calgarians want. In the last several years, Calgarians have been surveyed and have participated in comprehensive, long-term visioning and planning processes. The imagineCALGARY Plan, which received the input of over 18,000 Calgarians, sets goals and strategies to make Calgary a green, equitable, community-minded city. Calgarians’ vision requires excellent public services and facilities. Economic and population growth also require increased public spending. 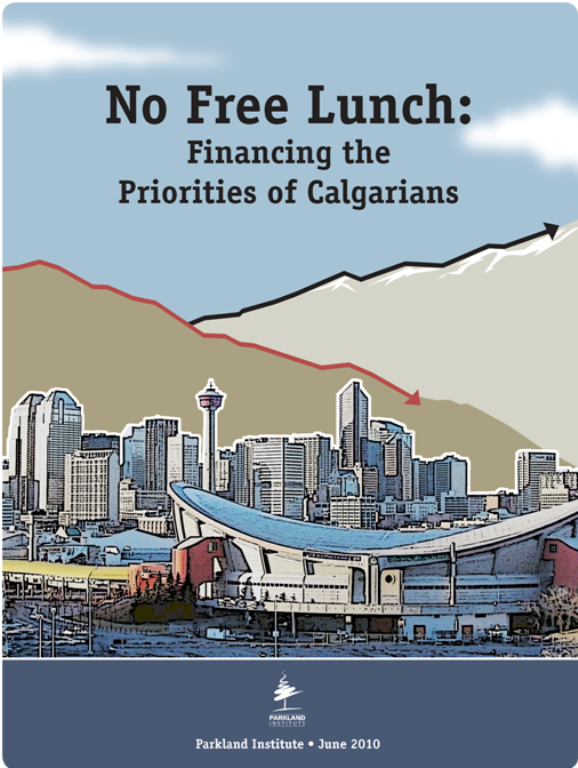 So how will the City finance Calgarians’ desires and support growth? Fortunately, Calgarians understand that excellent public services and facilities carry a price tag, and they are willing to pay. Public opinion surveys show that Calgarians are far more concerned with a wide range of social and environmental issues than they are about taxes. More Calgarians want taxes maintained or increased than want them cut. Indeed, in the imagineCALGARY process, Calgarians voiced their opinions that the municipal tax basket should be expanded, diversified, more progressive and employed to achieve environmental and social goals. Currently, the property tax is Calgary’s biggest revenue source, which is unfortunate as it is a regressive tax that does not grow automatically with economic growth—and Calgarians prefer other options. And while grants from senior levels of government are nice to get, they can’t be relied upon, particularly for operational spending. Grants are subject to the whim of senior governments, and can be cut when it is deemed expedient. Furthermore, they reduce transparency and accountability for tax dollars raised. Public-private partnerships (PPPs or P3s) and privatization are often presented as a panacea, a way in which corporations will help the public create facilities and deliver services. However, the “free lunch” these arrangements are often touted as providing simply doesn’t exist. Corporations aren’t about to hand over money or provide services or new facilities for free. Indeed, they tend to introduce new costs—ranging from CEO bonuses, to higher borrowing costs, to shareholder dividends, to lobbying and advertising costs. The vaunted “transfer of risk,” in which P3 private developers are said to absorb public risk, doesn’t come for free; it raises the price of the project. In the end, citizens pay for public services and facilities; it is not clear why they should be required to pay such additional costs. Another course worth exploring, as suggested by Calgarians, is the development of alternative local revenue streams. In addition to providing revenues for important public investments, these alternative revenue sources can encourage improved environmental and social sustainability. By including “externalities” (social and environmental costs) in market prices, taxes, charges and user fees can correct market failure. They can also reduce excessive consumption (e.g. of energy, water, road space, etc.) and by doing so, reduce the capital and operational costs faced by municipalities. While user fees got a bad name in the 1990s, when many regressive versions were created, the good news is that they don’t have to be regressive. They can be designed to be progressive in terms of consumption, income or wealth. And they can be designed to protect Calgarians with modest incomes. Implementing some of these revenue adjustments may require provincial legislative support in some instances. The City of Toronto Act provides an example of a city being entrusted with a suitable degree of autonomy; Calgary is being held back, and reform at the provincial level would be appropriate. Investing in public services and facilities has another substantial benefit. It creates jobs directly, by employing people to provide those services and facilities. It also creates jobs indirectly, in supplier industries. Finally, it creates induced employment in the industries that absorb spending from the above-noted workers. The number of jobs by investment created varies from industry to industry. Compared to the oil and gas industry, investing in municipal government services creates far more jobs per dollar invested, as well as more GDP growth per dollar. Likewise, when governments cut public spending, a lot of people are thrown out of work—both in the public sector and the private sector—and economic growth is diminished. Tax cuts can potentially create jobs, but not as many as public spending creates. In conclusion, it is clear that the City has realistic revenue options to support the priorities Calgarians have outlined, and to manage growth. Fortunately for City Council, Calgarians support the idea of exploring a new range of revenue sources. And fortunately for Calgarians, these sources can be designed wisely, so as to meet the revenue needs and also have positive effects on the environment and other areas. In a democracy, it is important to take citizen preferences seriously. The City has the capacity and the political room to address its financial needs honestly. Calgarians are ready for a mature conversation about public services, facilities and revenues. Is the City?